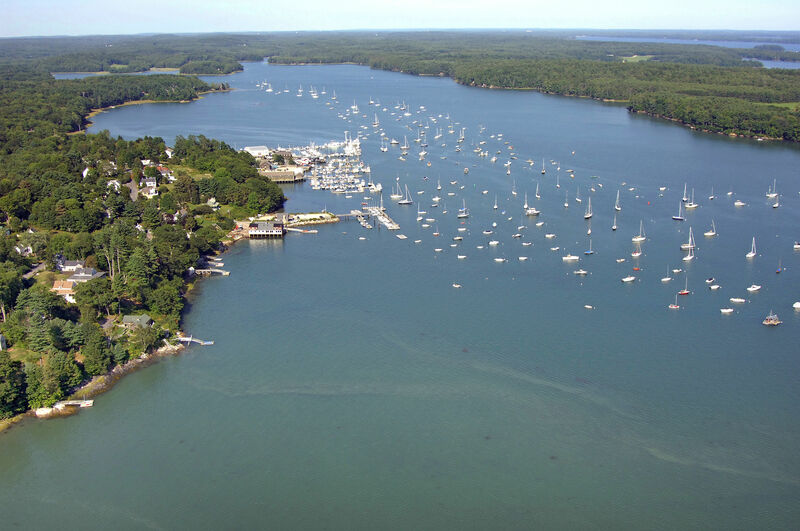 The Harraseeket River Inlet--gateway to South Freeport--is located just south of Wolf Neck off the town of South Freeport. South Freeport is 13 miles northeast of Portland and 40 miles east of Monhegan Island. The image above is a view from the southwest looking northeast over the Harraseeket River at the South Portland waterfront The large body of land off in the upper-right-hand portion of the image is Wolf Neck, while farther up toward the far end of the mooring field, Weston Point is visible. The first marina on the left is the Stouts Point Wharf Co., while farther up on the left is the expansive Brewers facility. There are four marine service and marina facilities inside the Harraseeket River at the town of South Freeport. 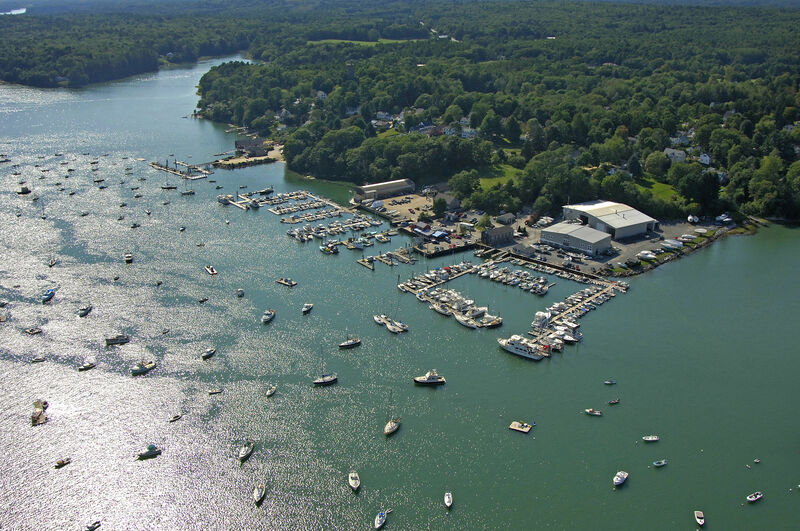 Brewer South Freeport Marine is by far the largest and is also home to the Harraseeket Yacht Club and Rings Marine Service. Brewer South Freeport Marine has transient slips available for visiting boaters, transient moorings, gas and diesel fuel, and a lift for haul-out and related repair services. Additionally, Rings Marine service has a lift and performs extensive repairs. Strouts Point Wharf Company is also located in the area with similar services like transient slips, transient moorings, gas and diesel fuel, a lift for haul-outs and on-site repair services. Freeport is often credited with being the birthplace of the state. In fact, many meetings of Maine leaders took place at Freeport's Jameson Tavern, debating and planning the separation from Massachusetts, which took place in 1820. From red nun buoy 2, set a new course of about 314 degrees magnetic for .7 mile where you will find flashing red buoy 4, which is visible to the lower right in the image above. Past flashing red buoy 4, you will follow a winding passage past green can buoy 5, green can buoy 7, and then green can buoy 9 north of Pound of Tea Island. After you have reached green can buoy 9, continue north and follow a short string of red and green buoys (all unlit) toward the South Freeport waterfront, which should be clearly visible at this point. Freeport is accessible by car or taxi. At this time there is no public transportation directly to Freeport but you can take the Concord Trailways busline to Portland, Maine, 25 miles south of Freeport and then take a public taxi to Freeport. Suggested Taxi services are Classy Taxi (207-865-0663 / 1-800-499-0663) or Freeport Taxi (207-865-9494). Car rental companies are in Brunswick, Portland and at the Portland Jetport. No reviews yet! Be the first to write a review of South Freeport.